November is one of my favourite months out of the whole year. Yes, really! And I'm sure you hardly believe me because most of the sports my family enjoys are not exactly "in season" right now. We haven't decided to try fat biking yet, hiking is well past its prime with snowshoeing still a ways out for powder, I don't paddle when there's ice forming on lakes, and skiing isn't exactly great yet. Shoulder season is definitely tricky but I still LOVE November and I'm excited to share my favourite things to do this month with you. I've always loved Banff in November. It's quiet, the tourists are long gone, and ski season hasn't really started yet. We head out mid-morning for a relaxed start, easy peasy day trip, and go for a short walk around town, ride the gondola, stop in at the hot springs, or sometimes even stay overnight. It's a great season to visit Banff. This year, the Banff Gondola should be one of the top things you think about doing if you plan a day trip to Banff. The upper terminal has recently undergone a $26 million renovation and is looking fabulous! "Journey to the top of the Banff Gondola to see a whole new side of Sulphur Mountain and the Canadian Rockies. We’ve completely rebuilt, redesigned and reimagined our mountaintop experience, creating a world-class indoor experience that equals the awe-inspiring ridgetop boardwalk 2900 ft. above Banff. From new restaurants and interactive exhibits to a multisensory theatre and a breathtaking 360-degree rooftop observation deck, the all-new Banff Gondola experience heightens every sense. " I've been up twice now and am blown away by how amazing the interpretive centre is. I'd have to say that the Banff Gondola now has the best "family museum" or interpretive facility in Banff National Park - and the views aren't bad either! On a budget? You can always hike up, check out the indoor exhibits, watch the movie, and then get a discount ticket for the ride down. A One-way down ticket is $25 for an adult and $13 for a child (aged 6 - 15 years.) Children under 6 are free. Visit the Banff Gondola website for full pricing details. If you decide to hike up to save a few bucks, I'd recommend spending the saved money on lunch in the upper terminal. The Northern Lights Cafe has done away with the old cafeteria style menu that you used to find when you got to the top of the gondola. Now you'll find fresh sandwiches, soup, pastries and other goodies, along with fancier options that would make you think you were having Sunday brunch at the Banff Springs Hotel. And they serve Starbucks coffee! Visit the gondola website for information on all dining options. For a special night out in Banff, have dinner at the Sky Bistro in the gondola's Upper Terminal. The Signature Sky Experience includes admission to the Banff Gondola and your choice of any two-courses from the menu starting from $65. Full info can be found on the Sky Bistro website. Visit the Sky Bistro during Banff's Taste of Adventure Festival. The event runs through Saturday, November 5th. The Taste of Adventure package includes your admission to the Banff Gondola and a three-course tasting menu from $49.00 - which basically means you're getting a free gondola ride! This is a great deal and I'm still trying to figure out if I can fit it into my own calendar! Visit the Banff Gondola website for more information or contact the Sky Bistro directly. Also, the Banff Gondola is now featuring stargazing every Friday night from from 6:00pm – 8:00pm (included with admission). For more information, go to the Gondola Events Page. How could you ever have a bad day on top of a mountain? I have four tickets to give away to one luck family so that you can come visit the Banff Gondola and check out the newly renovated upper terminal for yourselves. The tickets are valid through December 31st, 2016. For full details and to enter, please proceed to the bottom of this blog post. 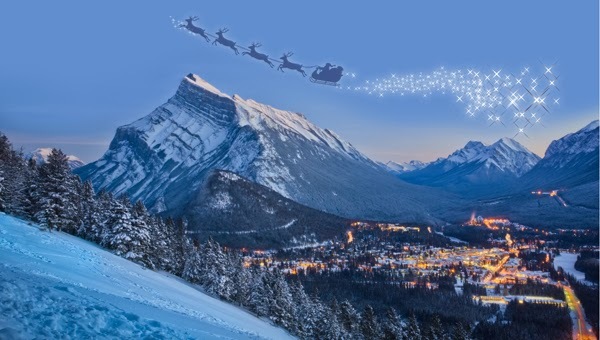 This year, the Banff Santa Claus Parade takes place at 6pm on Saturday, November 19th and while that may seem a bit "early," it does give one another reason to visit Banff this month. Enjoy a hike on one of Banff's easy trails. Some of our fall favourites are Sundance Canyon, the Fenland Trail, and Stewart Canyon at Lake Minnewanka. Visit the Banff National Park website for information on easy hikes in Banff. Johnson Lake in Banff has always been one of the first lakes to freeze and my family has skated on it for the past 5 years now. One other spot where we enjoy skating, not mentioned in the stories above, is on the pond at Kananaskis Village (Cleared by Delta Resort Staff and open to all visitors with skate rentals on site.) It is usually ready to go by Christmas or earlier if we get really cold weather in December. By November I'm always longing for snow and would drive hours to find it. Fortunately, we don't actually have to go that far though because Highwood Pass is the highest paved road in Canada and gets a lot of early season snow! I've written a LOT on this topic already so please visit these stories below on November at Highwood Pass and make sure you get out by the end of the month. The road closes at the end of November and will be closed until late June next year. This is a very brief window to snowshoe up to Elbow Lake or Ptarmigan Cirque while you can drive to the parking lots. For those who enjoy downhill skiing, most resorts will open in November. Nakiska Ski Area was the first ski resort in Canada to start snow making this winter and is supposed to open weekends starting November 5th from what I've heard. 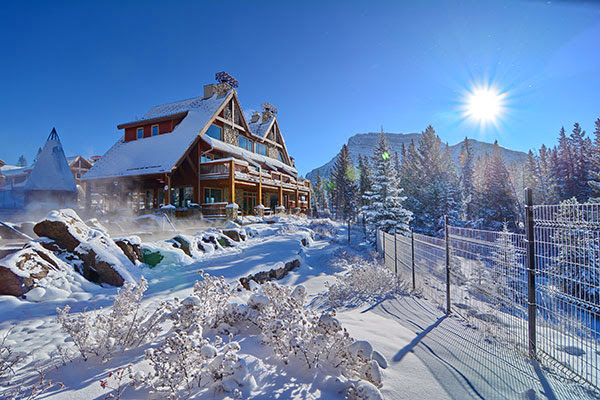 For updates on Nakiska's opening date, please follow them on Facebook or Twitter, check my Facebook page where I'll have updates, or contact Resorts of the Canadian Rockies directly. For information on other ski resorts and opening dates, visit their websites directly. Early season skiing at Nakiska looks pretty good! Kananaskis Village or West Bragg Creek are closer options and I've skied both most years in November. Don't expect "amazing" snow until later in November, but if you really want to get out, both should have some track setting up by mid to late November. Peter Lougheed Provincial Park is also a good bet for early season skiing if you head to the Elk Pass parking lot. Finally, we LOVE skiing the Cascade Fire Road up the Cascade Valley in Banff in November. It requires very little snow to be enjoyed on skis and last year we skied it on the third weekend of the month. The trail starts from the Lake Minnewanka Parking lot. Banff Mountain Film and Book Festival - October 29th November 6th.Visit the website for information on the program, for free events, and to buy tickets to watch any of the films. Banff Craft Beer Festival - November 25th and 26th. Visit the website for more information and to buy tickets. Banff Christmas Market - November 25th - 27th. Visit the website for more information. November is an awesome month! Please enter below if you will be available to make the trip out to Banff before the end of the year to visit the Banff Gondola. The contest closes at midnight on November 6th with winner notified on Monday the 7th. If I can not contact or reach the winner by Wednesday the 9th, I will choose another winner. Special Thanks to Brewster Travel Canada for partnering with me on this month's edition of "Gotta Do THIS." I know that one family is going to be very happy to win tickets to visit the gondola. Thanks as well to Brookline Public Relations for assisting with the contest. Hopefully skating on a mountain lake. Always love reading about your adventures! I'm especially excited to find out about the santa parade being bumped up a month earlier! We are definitely going to make a trip out! Thanks for the great ideas! It will be interesting taking my 2.5 year old out this winter as I think she'll be a bit young for winter sports but getting a bit too big to be in the backpack. Easy hikes around Banff might be a good bet for us. It's both my Sons and my husbands birthday in November so I'm hoping we can win this and head out at the end of November!! We've never done the Santa clause parade, but it's on my list now!! We've been in Calgary fo over 4 years now and I feel this is the time we are ready to try snowshoeing and let it be at Elbow Lake! Thank you so much for this blog!! Skiing, skating and maybe even tubing this year. Oh. And a sleigh ride with my parents. Ice skating on a mountain lake sounds fantastic! Bringing my 4 year old to Banff for our second annual fall mom and son mountain adventure! Looking forward to fresh air and bonding time. Hanging out with my 4 year old on our second annual mom and son fall mountain adventure. looking forward to fresh air and time together - hiking, skiing, skating, and hot chocolate! love shoulder season with 4 littles under 8 shoulder season is where it's at! Love sledding and skiing and of course the excuses for hot chocolate after! I hope it's great skiing this year, it would be so fun to start so early! I'm looking forward to snowshoeing with my family! I love experiencing things in winter that I've done in summer. Like a whole new experience. thanks for chance to try Banff gondola in winter, would never have even thought of it. Can't wait to go snowshoeing with the family at elbow lake this month! Bring on the snow - the skiing and the skating. Snowshoeing! And finish it off with sledding and the hot springs! Soon excited to try the new Banff Gondola! and yes, as others have said, finishing off in the hotsprings! Looking forward to trying the Banff gondola, 8it had been on the list for awhile now. I had never thought to do it in November!!! I would love to go skating and cross country skiing this month in the rockies! I'm super excited for a soak in the Hot Springs!! Excited about the Santa Claus Parade in Banff this November with friends and family! We are very excited for it to SNOW this month!!!!!!! Can't wait to ski! Awesome ideas, as always! We'll definitely be taking the family out to enjoy the Santa Claus parade, sounds fantastic! We are super stoked about ski season at our house - Lake Louise Nov 10th!!! And, my daughter just got skates so we are hoping to check out some of your great suggestions for cool outdoor skating options too! Hot Springs is your favourite anytime of tthe year!! I would love to break out my cross country skis this month!